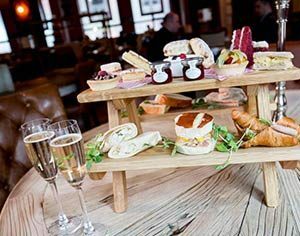 Another Valentine’s Day in Liverpool and another chance to look back at the three great loves of The Shankly Hotel’s namesake. It’s an undeniable, unrelenting passion that the Liverpool manager had for the game. Indeed, he probably would’ve sneered at us for referring to football as a game. Shankly’s love for the sport ran so deep, as deep as a Valentine’s Day rose planted in the ground, that he is known for having just three great passions. His football, his darling wife Nessie and his family. The couple met during their time stationed at an RAF barracks just outside Glasgow where Nessie was working in the WRAF. They were married in 1944 and had Barbara, one of two children, in 1945. Nessie’s unquestioning attendance of a match for a birthday present set the pace for a future existence of supporting her husband’s insatiable appetite for the beautiful game. “it was Accrington Stanley but it wasn’t a birthday present”. We can only imagine what he got her for Valentine’s Day. Nessie was a player’s wife long before she became the second lady of Liverpool. 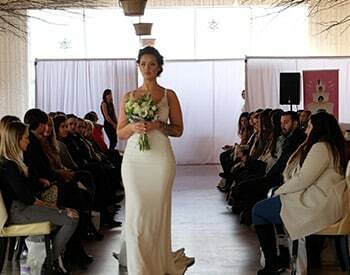 During the early years of her marriage, she married a superstar whom 5 years later became manager of Carlisle United. From here, Shankly went on to manage Huddersfield Town in 1956. Then, in 1959, he moved to Liverpool for what would be his swansong. Nessie was behind her husband through think and thin, never complaining and buoyantly supporting his unrelenting passion for football. While her husband would be out giving everything he had in the dugout, Nessie would be at home helping raise the grandchildren, despite having already brought up two daughters. Nessie would also devote her time to entertaining and feeding fans of her husband and the hungry groundsmen of Melwood. The couple remained a beacon of true love. It wasn’t until 1974 – 30 years after they married – that the great man decided to relinquish his hold on Liverpool in favour of spending some quality time with his family. So, in time, Nessie’s utter devotion to her husband bore fruit. He had come to realise that, even though his love for Liverpool was strong, his love for his family was even stronger. 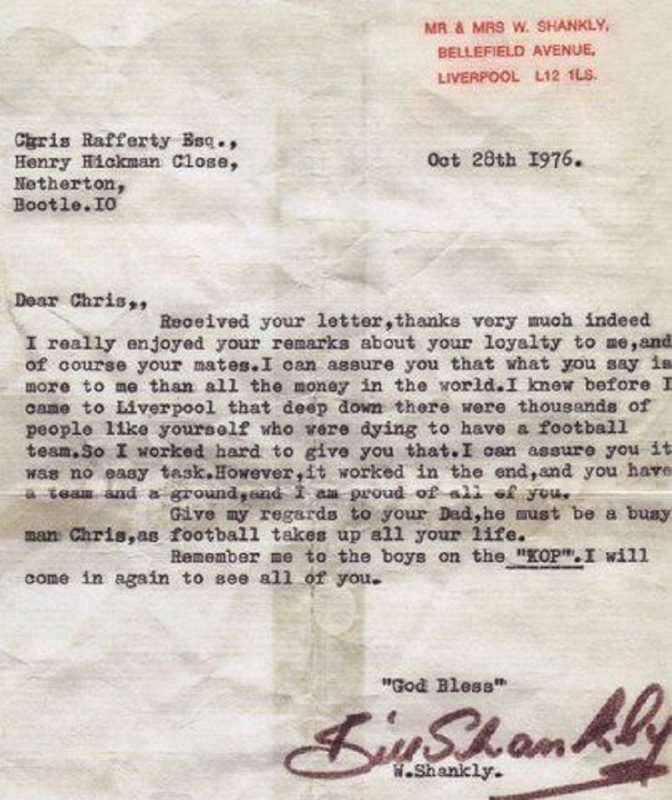 Shankly was, and is, adored by the people of Liverpool. His dedication to the city endeared him to us Scouser’s. That said, without the unyielding love and support of Nessie, his achievements would not have been possible. After years of tracking his successful career across the county, Nessie and her famous husband would settle in Liverpool; laying down routes that would ultimately help them leave a loving legacy. Even with the tragic passing of her one true love, Nessie was comforted by the fact that the people of Liverpool would remember Shanks with as much fondness as she would. 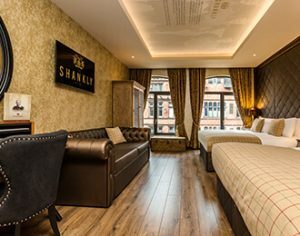 At The Shankly Hotel, our guests can come and learn everything there is to know about Shanks and Ness. 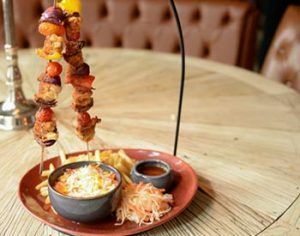 The Shankly Hotel is built upon strong family values. The commitment our namesake and his loving Nessie had to one another’s happiness is awe-inspiring to say the least. 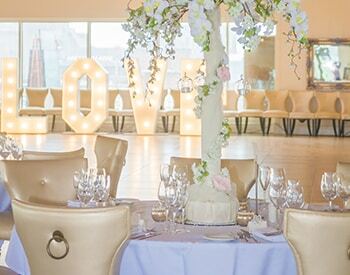 Love continues to be a huge part of what goes on at The Shankly Hotel as we have celebrated many happy couples’ special occasion. 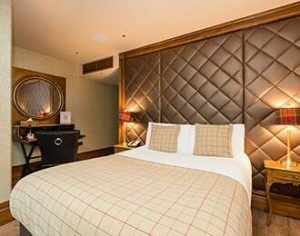 So, on Valentine’s Day in Liverpool this year – and, for the rest of the year ahead – come and stay at the now famous Shankly Hotel and make some enduring memories of your own. 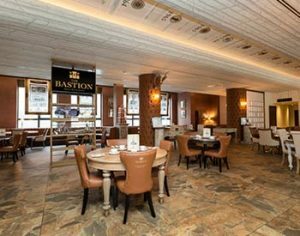 Also, come and dine with us at the superb Bastion Bar & Restaurant. 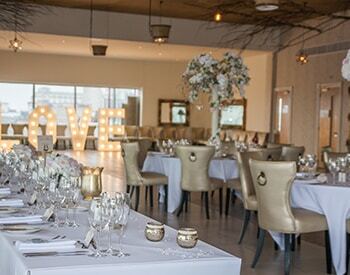 Get in touch with our helpful team today on 0151 236 0166 or check out our latest Valentine’s Day deals . And, to keep up to date with everything going on at the hotel, follow The Shankly Hotel Facebook page. The people of Liverpool and fans of LFC remember and cherish Bill Shankly’s name and memory as an undeniable force of kindness. On world kindness day we’ve decided to explore some of the ways in which Bill Shankly’s kindness has endured today. It’s a well-known fact that Bill Shankly was a man of the people in every interview given by those who knew him well, endless anecdotes are recounted about his unfailing ability to lift people’s spirits. Accounts of utter selflessness, unyielding determination to get the best out of people and a wicked sense of humour are all available to read about in the Shankly stories. We have picked out a few instances where Shankly’s kindness stood out for family members and fans, remaining still strong in their memories today. Grandson Chris Shankly recalls an interview with his mum when probing about what Shankly was like in the home. Jeanette remembers her father being entirely devoted to football and LFC, but this didn’t detract from his domestic duties around the house. He helped wherever he could and often got involved in household improvements proving he could still be counted on as the man of the house. The stories, however, did not always involve domestic successes as Jeanette thinks back to a time when the garden wall was repointed. Shanks came home and realised the workmen had left quite a mess on his front path, so he grabbed the hose to wash away the debris only to also remove all the fresh pointing from the wall as well. The kindness of Bill Shankly certainly didn’t stop at work or at home and it was his love of the people of Liverpool that has kept him held in such high esteem for all these years, a hero of the city. After retiring from his position as manager at LFC to spend some quality time with his family Shanks often received fan mail and it was his pleasure to reply to as many as humanly possible. One such letter to a 13-year-old boy shows just how much he honoured his fans and cherished their admiration and support. 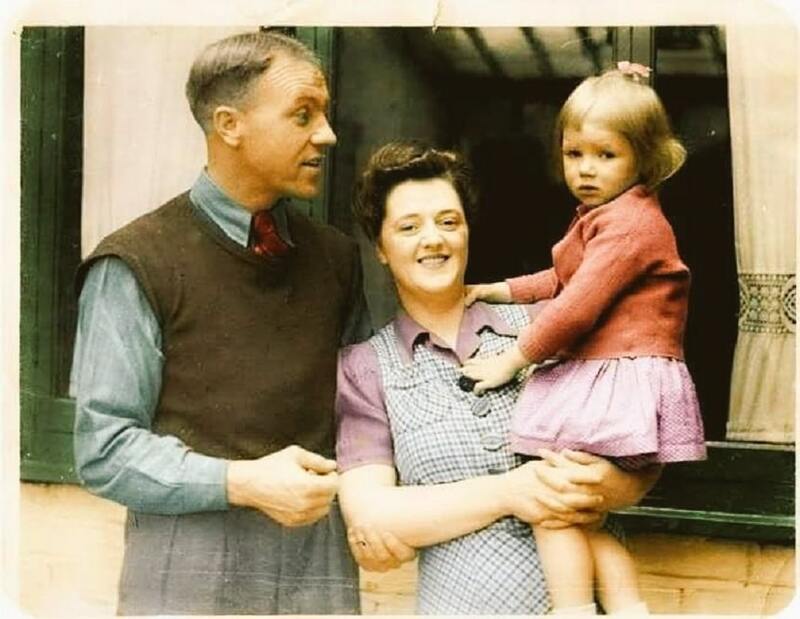 It’s not hard to see why Liverpool adopted Shanks as an honorary Scouser the man literally lived for his family, the game and the people and was devoted wholeheartedly to all three until the end. The woman behind the great man, Agnes Wren Shankly was hailed by many as the first lady of football. 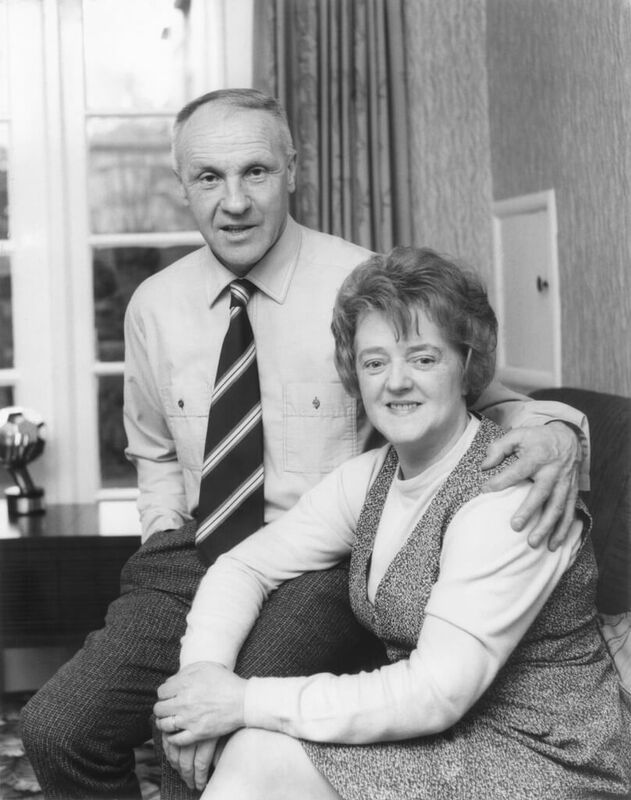 A gentle soul with a strong spirit and an unwavering support for her husband, Nessie was credited with being the glue that held the Shankly household together. When she wasn’t cooking or providing refreshments for fans who knocked to see or speak to Bill she was getting involved in as many local charities as possible including RNIB among others. Chris has fond memories of calling in on his Nanny Ness whilst playing with friends, asking for his usual weekly pocket money and a Chunky Choc Ice. His memories include having the best cups of tea and being quizzed about his wellbeing. A story about Nanny Ness that perfectly supports the ideas behind world kindness day is the day Nanny Ness was robbed. She had driven to show her face at an event and left her belongings in the car which was broken into and her belongings were stolen. When word got out that these belongings were that off Nessie Shankly’s they were returned sharpish showing that because Nessie looked after the people they, in turn, looked after her. These may seem like the actions of any devoted Grandmother and wife but given the fact that Nessie’s husband was also married to the game of football it must have taken a lot for her to remain such a steadfast support to Bill Shankly and their family. Of course, any venture to bear the name of Shankly under the guidance of the Shankly family themselves has at its heart a drive to satisfy and impress; just like Shankly himself. With this in mind, those who own and operate The Shankly Hotel work hard to ensure every guest through the doors are given exceptional experiences and the chance to make fond everlasting memories. There have been instances where staff have been able to continue the legacy of kindness left behind by Bill Shankly. 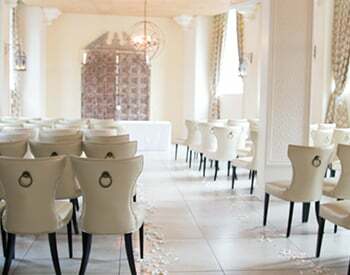 These have been wonderful opportunities where a Liverpool hotel has enriched the lives of individuals by extending the type of kindness expected from Bill Shankly himself. Like the terminally ill elderly lady who was welcomed at The Shankly Hotel during a trip to Liverpool to see LFC play at Anfield. 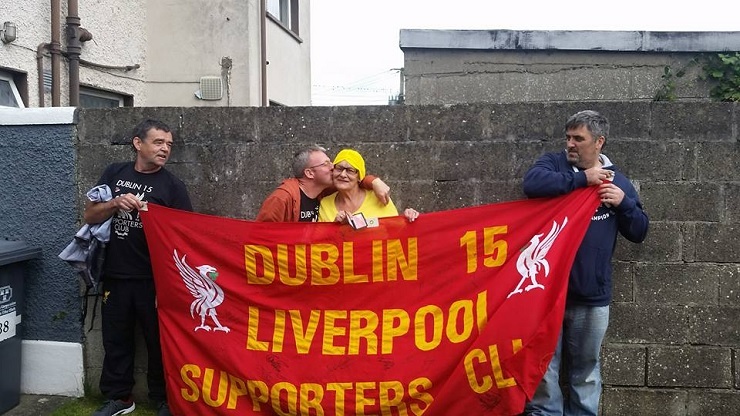 Marie Wright’s wish was made true by the wonderful fans at Irish Reds Club and Dublin 15 LFC, who arranged for a carer and wheelchair access into the match so Marie could see her team play a home game at least once in her lifetime. Upon receiving contact from the groups Chris Shankly arranged for Marie to visit The Shankly Hotel along with her family where she could shake the hand of LFC Legend Roy Evans. Just like Bill Shankly, when an inspiring story concerning a diehard LFC fan reached the ears of Chris Carline he did what he could to reach out and do something kind. 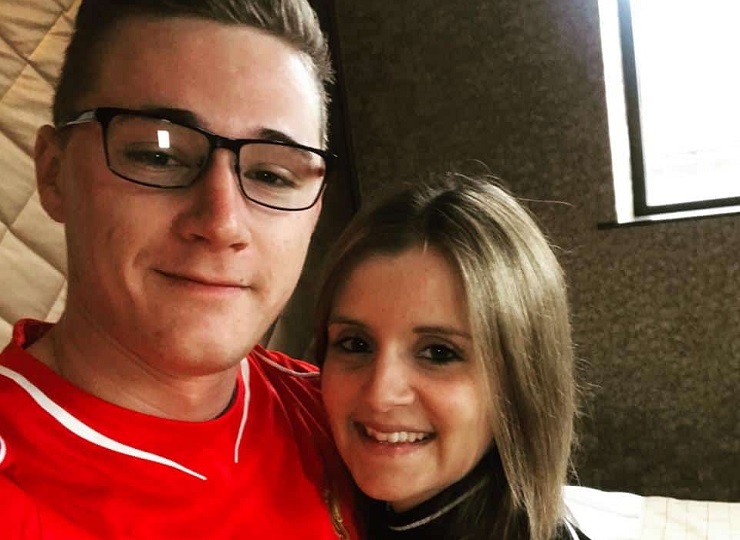 Katie and Sam are a young couple who had planned to visit Liverpool to watch Sam’s team, LFC at, home. This was a gift from Katie and the pair were very excited to visit the city. Sadly, one January morning in 2016 Katie was unfortunate enough to have a car accident which left her seriously injured and unable to carry out her well-laid plans to join Sam at Anfield. The pair gave up their match tickets worked on Katie’s recovery. Miraculously Katie did pull through and was able to walk, talk and study again by April 2016. 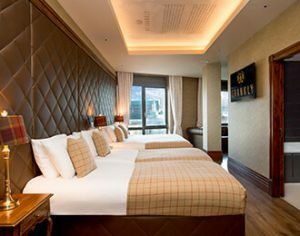 A friend got in touch with both LFC and The Shankly Hotel and between the two Katie and Sam were invited to watch another game at Anfield and enjoyed a two-night stay at The Shankly Hotel. Bill Shankly would be beaming at his grandson’s actions to both Marie and Katie as his own kindness was his dedication to the fans believing and knowing it was their support that made his time at Liverpool so rewarding. 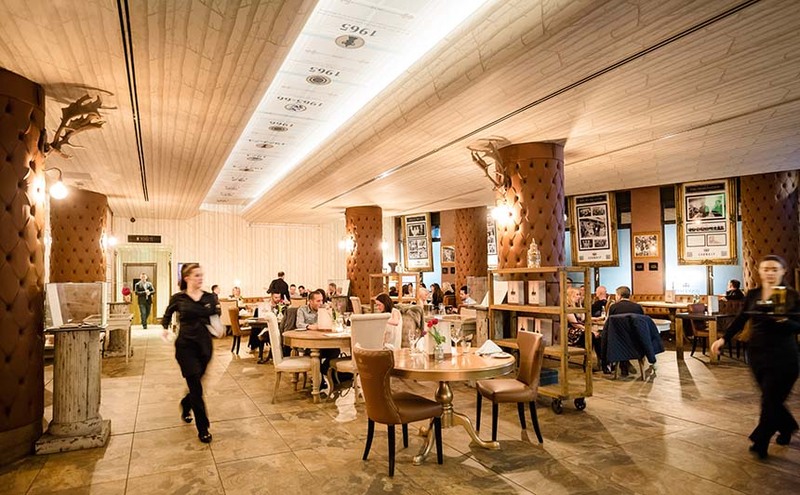 The Shankly Hotel is dedicated to making happy memories for everyone who comes through our doors. 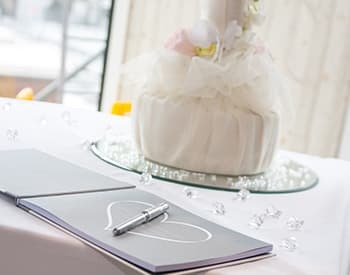 From the individual guest to entire wedding parties, we make it our mission to be kind and considerate to everyone we come into contact with every day. See if you can remember the last time you reached out with an act of kindness on world kindness day 13th November 2017, or let us know if you can remember a time when someone was particularly kind to you. It costs nothing to be kind. Shankly’s life was an interesting one to say the least. From being born in Glenbuck, to living in Liverpool as an honourary Scouser till the end. Here’s a timeline of important events during Shankly’s 68 year life and beyond! 02.09.1913 – William Shankly is born in Glenbuck, Scotland. 1931 – He plays football for his local team in Ayrshire, Cronberry Eglinton. 1932 – Shankly moves south where he joins Carlisle United in Third Division North. 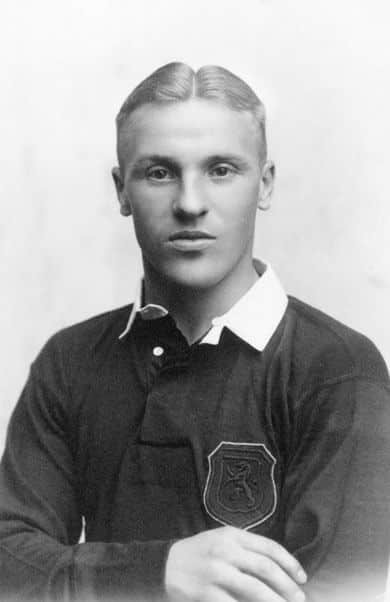 July 1933 – After a remarkable season for Carlisle Shankly signs for 2nd division Preston North End. 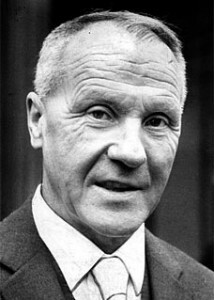 Preston was soon promoted as Shankly’s career flourished. 09.04.1938 – Shankly was selected to play for his country, Scotland for the first time, playing against England in a 1-0 win at Wembley. 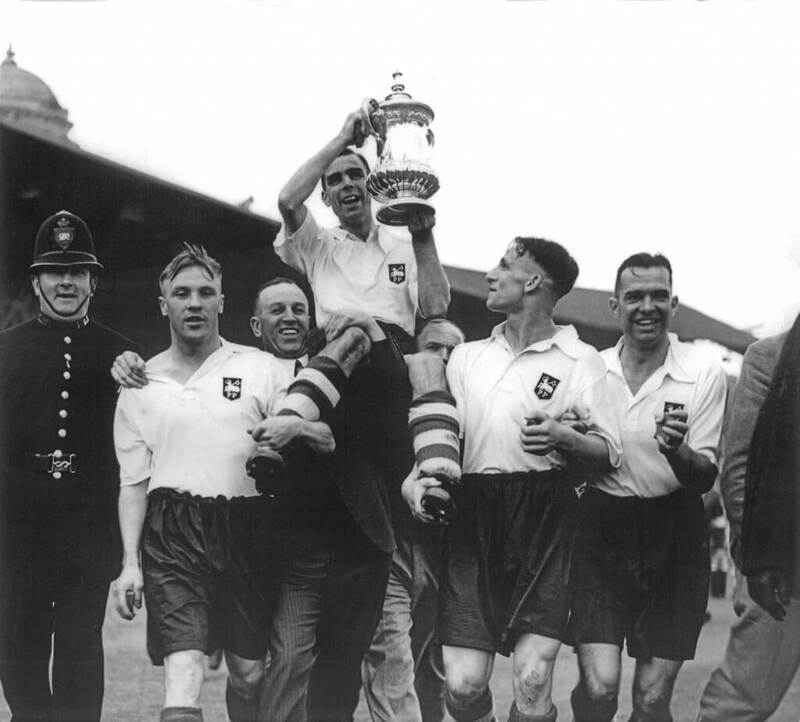 30.04.1938 – Shankly’s highlight as player when Preston wins the FA Cup by beating Huddersfield. 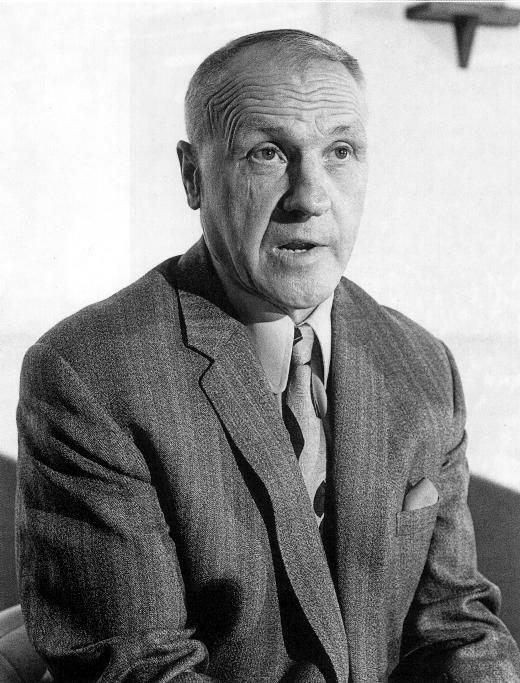 22.03.1949 – Despite feeling he had more to offer as a player, 35-year-old Shankly took the manager’s job at Carlisle United. June 1951 – Grimsby’s board felt Shankly was the right man to revive the club that had dropped from Division 1 to regional football in Division 3. 1951 – Liverpool interview Shankly for the vacant manager’s job at Liverpool. 06.01.1954 – Shankly moves down the ranking in Third Division North, but saving Workington from destruction is a commendable challenge. 05.11.1956 – Takes over as manager of Huddersfield after coaching their reserves for 11 months. 01.12.1959 – Liverpool appoint Bill Shankly as Phil Taylor’s successor in the managerial seat. 14.12.1959 – Shankly takes officially over at Liverpool after finishing his occupancy at Huddersfield. 19.12.1959 – Shankly is in control of his first Liverpool game, but it’s a long way from a perfect start as Liverpool lose 0-4 to Cardiff. 21.04.1962 – After seven years in the 2nd division, Liverpool are promoted with five League games remaining! 18.04.1964 – Liverpool win the championship for the sixth time in their history after a 17 year wait with an impressive 5-0 win vs Arsenal at Anfield. 01.05.1965 – Liverpool win the FA Cup for the first time in the club’s history. Shankly added that it was his finest moment at Liverpool. 12.05.1965 – Liverpool knocked out of the semi-finals in the club’s inaugural season in the European Cup. After a sensational 3-1 win at Anfield in the first leg, Inter beat the Reds 0-3 in Italy after bribing the referee! 30.04.1966 – Liverpool close their second League title under Shankly by beating Chelsea 2-1 at Anfield. 08.05.1971 – Liverpool lose 1-2 to Arsenal in the FA Cup – Shankly delivers the famous Chairman Mao speech. 08.07.1971 – Shankly agrees a new three-year contract with Liverpool which became his last. 23.04.1973 – After 7 years deprived of a title, Liverpool win the championship by beating Leeds 2-0 at Anfield. 23.05.1973 – Liverpool beat Gladbach 3-2 on aggregate in the UEFA Cup final, almost conceding their 3-0 lead from Anfield. 1973 – Bill voted Manager of the year, the only time in his career! 04.05.1974 – One of the most one-sided FA Cup finals in history when Liverpool annihilates Newcastle 3-0 at Wembley. 12.07.1974 – The football world and the whole of Liverpool are stunned when Bill Shankly announces that he is retiring as Liverpool’s manager. 10.08.1974 – Shankly is given the honour of leading Liverpool out at Wembley vs Leeds in the Charity Shield despite retiring in the summer. 12.08.1974 – Bill Shankly legitimately terminates his ‘reign’ as manager of the Reds in Billy McNeill’s testimonial in front of 60,000 people at Celtic Park. 29.04.1975 – Shankly’s testimonial against a Don Revie Select XI – an emotional night at Anfield. 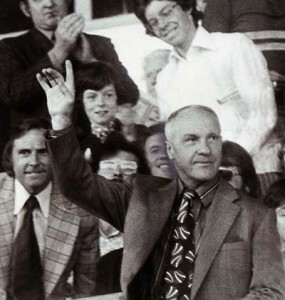 25.05.1977 – Shankly was in attendance when Liverpool won its first ever European Cup in Rome. 29.09.1981 – Shankly passes away. Bill suffered a cardiac arrest after battling for life since a heart attack early on Saturday morning. He had been making good progress until his condition deteriorated. 30.09.1981 – Liverpool face Finnish European Cup opponents, Oulu Palloseura, at Anfield. Reds won 7-0 and for the whole of second half the Kop sang Shankly’s name to the tune of Amazing Grace. A banner in the crowd reads “King Shankly lives”. 03.10.1981 – Bob Paisley and John Toshack lead out their teams at Anfield in the league. Tosh, who was now the manager of Swansea, created quite a stir among the Swansea faithful when he revealed a Liverpool shirt underneath his Swansea tracksuit when Shankly was remembered before the game. 22.11.1981 – “A Service of Thanksgiving for the life of Bill Shankly” held at Liverpool Cathedral. 26.08.1982 – Shankly Gates unlocked by Bill’s widow, Nessie. 27.04.1997 – The Shankly memorial is erected – a fitting tribute in his hometown, Glenbuck. 04.12.1997 – The statue of Shankly in front of the Kop is unveiled. June 1998 – Preston North’s End ground was replaced by a new stand named the “Bill Shankly Kop”, designed with different coloured seats providing an image of the great man’s head and shoulders. 18.12.1999 – A mosaic on the Kop to celebrate the 40th Anniversary of Bill Shankly’s arrival at Anfield. 02.08.2002 – Nessie Shankly passes away, 82 years of age. 2002 – Bill Shankly is introduced to the English Football Hall of Fame due to his impact on the English game as a manager. 08.11.2004 – Bill is introduced to the Scottish Football Association’s Hall of Fame. 01.12.2009 – 50th anniversary since he signed his contract to become manager of Liverpool Football Club. 16.12.2009 – A “SHANKS LEGEND” mosaic was unveiled on the Kop prior to kick off. 17.12.2009 – Shankly is awarded an Honorary Citizenship of Liverpool in recognition of the 50th anniversary of his arrival as manager of Liverpool FC and his dedication to Merseyside. 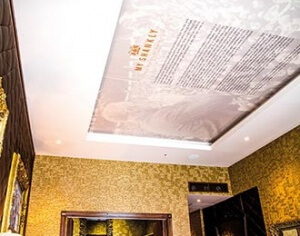 May 2014 – A Shankly themed hotel and museum is unveiled by Shankly’s family and Signature Living. What was your favourite Shankly moment? Let us know on Facebook or Twitter! Credit to www.shankly.com for providing the timeline dates. 12th July 1974: The date the Godfather of the Kop, Bill Shankly, announced his retirement. Nobody knew what to expect when a sudden press conference was called by John Smith, the club’s chairman at the time. As the press filtered in with their notepads, cameras, and Dictaphones at the ready, there wasn’t a buzz of excitement. Unlike a usual event of this kind there was instead a dullness in the air. Shankly agreed to a three-year contract with Liverpool Football Club during the signing of his last contract in July 1971. He was then offered the option of having it extended to five years. When the three year mark was met, Smith asked if he would like to continue for two more years. Shankly declined. It was widely speculated as to why he refused to stay those two more years. Even those closest to him like his wife and Bob Paisley had their own theories regarding the subject. Conclusions were drawn that former England captain Emlyn Hughes once asked Bill why he chose to retire. Shanks said “I’m going to tell you the reason why I left” but his small grandchild came running in, and he got sidetracked. Emlyn never found out. Without realising it or not, Hughes actually got the truthful answer to his question. Bill became anxious to spend more time with Nessie, his children, and his grandchildren. Rumour has it almost immediately after resigning, Bill thoroughly regretted his decision. By the time the new football season came around, Shanks was back at Melwood FC, training with the players, enjoying the camaraderie and the chance to put his boots on again. Some players were calling him ‘boss’ and treating him as equally as their real manager Bob Paisley, to his annoyance. The retirement was a clean break between LFC and Shankly, to both side’s disappointment. However living close to Everton’s training ground, Bill would often call in and join in the training sessions, proving that many of his cutting comments about Liverpool’s city opponents were no more than harmless shots to fabricate a sense of bitter rivalry. Shanks spent his first Saturday afternoon in retirement watching Everton Vs Derby County as the club’s special guest, and was met by a rapturous applause by the Goodison crowd. He would talk to anyone about football and go anywhere to put his boots on again. Simply because, he just loved the game. To him, the beautiful game was just that.